We are back with our second Race Success workout. 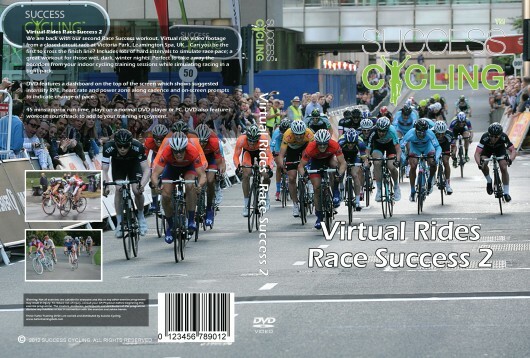 Virtual ride video footage from a closed circuit race at Victoria Park, Leamington Spa, UK… Can you be the first to cross the finish line? Includes lots of hard intervals to simulate race pace; a great workout for those wet, dark, winter nights. Perfect to take away the boredom from your indoor cycling training sessions while simulating racing in a tight pack. We are back with our second Race Success Turbo Training DVD workout. Virtual ride video footage from a closed circuit race at Victoria Park, Leamington Spa, UK… Can you be the first to cross the finish line? Includes lots of hard intervals to simulate race pace; a great workout for those wet, dark, winter nights. Perfect to take away the boredom from your indoor cycling training sessions while simulating racing in a tight pack. Download features a dashboard on the top of the screen which shows suggested intensity RPE, heart rate and power zone along cadence and on-screen prompts to indicate change of pace.